Need something to do on August 8th? 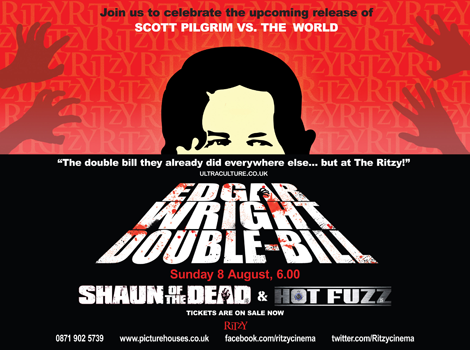 Why not get yourself down to the Ritzy in Brixton and watch both of Edgar Wright’s comedy classics in anticipation for Scott Pilgrim? Our name is on the poster, which can only be a plus. Tickets available here. Terrified at the idea of planning anything more than a week in advance? Don’t worry about it, have a nice Saturday.